Social & Content Marketing: WARNING! Your reach on Facebook is about to drop - dramatically! What you post on Facebook is seen on Facebook. All those fans (and friends) that have liked your page eagerly await your daily post to them... or do they? Maybe the would if they actually had a chance to see your posts! Since 2007 organic reach for pages on Facebook has steadily declined. In 2012 it was estimated that 16% of your total page fans saw your post. This would increase ever so slightly if the post got a lot of engagement (likes, comments, shares, clicks) which can still be the case today. In October 2013 it was estimated that just 12% saw posts and in February of this year one study showed that only 6% of fans saw posts! Why is Facebook "preventing" people from seeing your posts? Fans liked your page and took action to show they wanted to hear from you. Facebook claims it is due to "lack of space in the newsfeed". If this is indeed true, does that mean that soon there will be zero space for page posts in the newsfeed? This is a very damaging idea for businesses who have spent years building up their fan base and work hard to keep fans's interest. There is a way around the problem of fans not seeing your posts, but it won't come for free! Basically if your fans matter to you, you're going to have to start paying Facebook to show your fans what you post. This may seem a little sneaky, but Facebook isn't a charity or a free service. It's a business just like yours and mine. 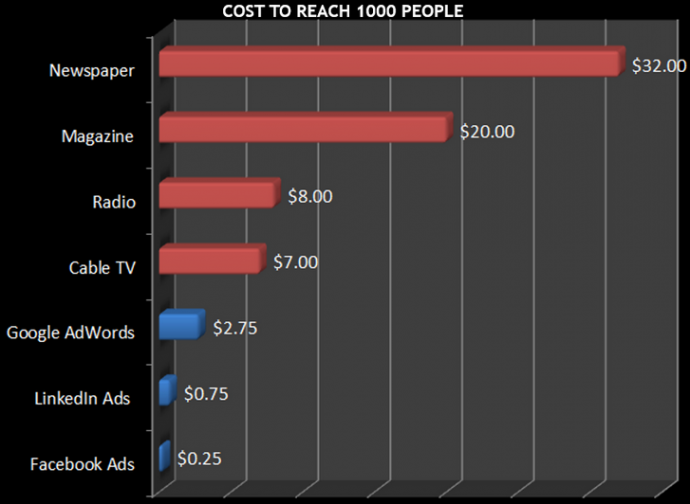 The good news is that Facebook advertising is very easy to use and very cost effective. Compared to print, radio, TV and even other forms of online marketing like Google AdWords and LinkedIn, Facebook has them all beat in the price department! So what are your options? Experts estimate that just CHF 1 day is all you need to keep your business in the Facebook marketing game. If CHF 30 a month isn't in your budget, maybe there are other ways to invest you marketing time and efforts than on Facebook. That's hard for me to say as someone who specializes in social media marketing, but that's the reality and why I still advocate for maintaining a regular newsletter. That's something you own and that no one - not even Facebook - can take from you.